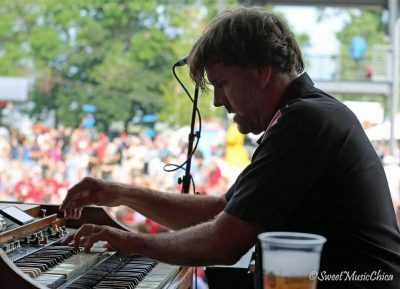 Jimmy Voegeli (pronounced “VAY-glee”) bought his first Hammond on-the-spot in 1990 without ever seeing or playing one before that fateful day. “My bass player saw it for sale in the local paper: a Blonde B-2 with a Leslie. The retired church musician fired it up and when the Leslie kicked in its gust sent papers swirling into the air. …MAN, I GOTTA have this!” The former church organ was loaded up then and there and immediately introduced to the world of debauchery and sin at a biker party gig that night, rocking through numerous versions of Steppenwolf’s Born to be Wild. It was over – Jimmy was hooked. Eventually amassing 8 Hammonds and 10 Leslies, Jimmy is THRILLED to have his hands on the XK5-Pro for his shows! Voegeli’s story is not typical of most musicians. To this day he still works part-time on his family’s 6th generation “World Famous Voegeli Farms Dairy” in southern Wisconsin (yes, they make cheese and yogurt) where they milk 220 Brown Swiss Cows, cultivate 1400 acres, and export award-winning animals and embryos to every continent in the world! (except Antarctica). Jimmy grew up in a house constantly filled with music and singing – his parents met at one of his father’s gigs. He took to the piano, yet floundered through piano lessons, then flunked high school band on trumpet. Jimmy made that report card the cover of his first solo album: “F” is for Blues,” featuring Grammy-winning bluesman Billy Flynn on guitar; Clyde Stubblefield, James Brown’s original funky drummer; and his inspiring tough-love band teacher, Mike Korth, on trombone. Since then Jimmy has played thousands of shows and recorded on nearly 100 albums with the likes of The Funkmasters (Clyde Stubblefield and Jabo Starks), Dan Baird and Homemade Sin (formerly The Georgia Satellites), Bryan Lee; and some Midwest favorites such as Reverend Raven & the Chain Smokin’ Altar Boys, Perry Weber, Jim Liban, along with a 16-year stint in the award-winning Westside Andy/Mel Ford band. Jimmy has shared the stage with Blues greats like Tinsley Ellis, Pinetop Perkins, Hubert Sumlin, Tab Benoit, EC Scott, Shirley King, Guitar Shorty, Greg Koch; along with Jazz greats Tony Monaco and Ben Sidran, to name a few. Voegeli has been a featured artist on two recent Legendary Rhythm and Blues Cruises. Now with his own band, brilliantly named The Jimmys, he has charted a course into the blues world as a fiery Hammond B-3 and piano player. Their four albums have won numerous awards and been twice-nominated for the prestigious Blues Blast Awards. With their frequent European tours, a yearly ‘Fans of The Jimmys’ retreat to the Caribbean, and constant touring in the US, they are considered a top festival draw. This 7-piece band with 3 horns has a powerful high-octane sound and an entertaining stage presence that will simply knock you out!